Mediterrano cook Merry Migliuri with the restaurant's gyro. The warm glow of hanging lights and the soft hum of conversation beckons you off of Main Avenue and through the open garage door. Inside Saranac Commons there's plenty of seating and four businesses to satiate your thirst and hunger. You can grab beers from Black Label Brewing Company, pastries from Common Crumb Artisan Bakery, coffee and ice cream from Caffé Affogato and Mediterranean food from the latest business to join the group, Mediterrano. Shahrokh Nikfar, who also owns Caffé Affogato, created Mediterrano to mesh with the artisan and community-oriented vibe of the Commons. He had local artists design and build elements of the wide-open exhibition kitchen, like the large table in the center and the pot rack hanging from the ceiling. "The whole idea was to create a place with an open kitchen concept, so people can see where it's being made," Nikfar says. "We wanted you to taste the love that goes into preparing the food." 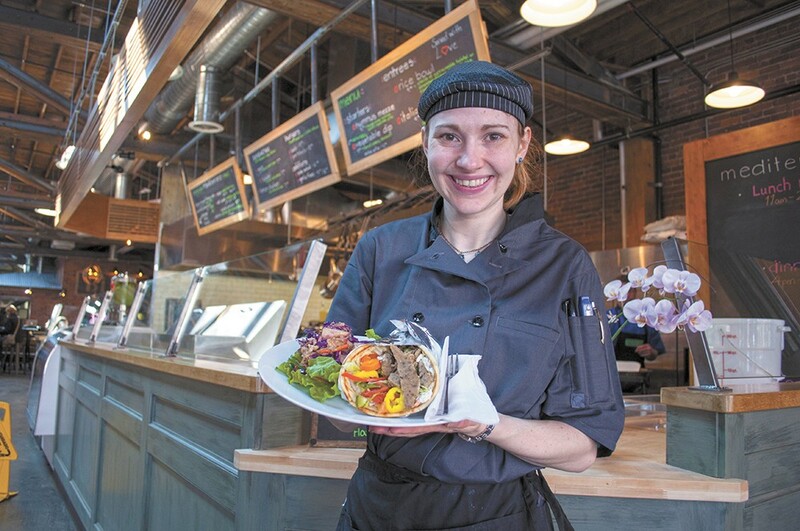 The fast-casual eatery uses largely local and organic ingredients to make dishes you would find in Middle Eastern and Mediterranean countries, where flavors like lemon, garlic and dill are commonplace. Head chef Merry Migliuri says the lemon chicken rice bowl ($10) is a colorful dish that's both refreshing and filling. The basmati rice is steam-cooked with seasonings, finished with herbs and paired with chicken that's roasted on the bone before being pulled off and seasoned with lemon pepper sauce. Vegetables are added, along with a dollop of tzatziki sauce for creaminess. A side salad or order of garlic fries dipped in cumin ketchup and lemon garlic aioli pairs well with the gyro ($8). A pocketless pita spread with housemade hummus and tzatziki features meat mixed with romaine, cucumbers, onions, sweet pepper rings and Lebanese pickles. Have a glass of Mediterrano's cucumber-and-citrus water or snag a beer from Black Label to go with the lamb burger ($10), a patty of hand-formed ground lamb with garlic and onion that gets a spoonful of rosemary-infused goat cheese while on the grill, then goes between buns spread with sun-dried tomato mint jam.